The SoCal BPP was the first chapter founded outside of the Bay Area, where the Party’s history started in Oakland, California. The Los Angeles Chapter was the most decimated chapter in the entire Black Panther Party with the murders of Party members by LAPD and agent provocateurs estimated at 10 or more for a single chapter of the Party. With the murders of L.A. Panthers, the framing of Geronimo Pratt (Ji Jaga) along with the infamous raid and shootout at the L.A. Panther office on 41st and Central would signal the demise of Bunchy’s chapter of the Party. Many members from this chapter went underground to continue work in the struggle and some would become part of the Party’s national leadership, like Ericka Huggins, Flores Forbes and Elaine Brown, who would become the only woman leader of the Black Panther Party in its history before the return of exiled Huey P. Newton. Bunchy founded the Southern California Chapter of the Black Panther Party in 1968 and by 1969 Bunchy was assassinated, along with fellow SoCal BPP leader John Huggins, by agent provocateurs within the US Organization at Campbell Hall on the campus of UCLA on Jan. 17, 1969. Bunchy Carter, John Huggins, Elaine Brown, Ericka Huggins, Geronimo Pratt and other L.A. Panthers were part of UCLA’s High Potential Program created by UCLA professor Daniel Johnson, which helped admit potential students from the inner city that did not fit the normal standard admittance process but showed high learning potential. After Bunchy’s death, his legend continued to grow throughout Los Angeles, where, prior to joining the Black Panther Party, he was proclaimed the “Mayor of the Ghetto” as the former head of the Renegade Slauson street gang after “graduating” from the leadership of the Little Slausons. L.A. is the city of his birth, on Oct. 12, 1942, after his parents moved to Los Angeles from Louisiana. His consciousness had been developed early when Bunchy became a member of the Nation of Islam’s Youth Fruit of Islam (FOI) but later went to prison on an armed robbery charge from 1963 to 1967. There he met writer and future Black Panther Party Minister of Information Eldridge Cleaver, who had left the Nation of Islam while in prison and tried to revive Malcolm X’s Organization of Afro American Unity, which had appeared to die with Malcolm. Bunchy would remain a conscious person until the end of his life. In the 2015-2016 NBC TV series Aquarius, Bunchy Carter was portrayed by actor Gaius as a Nation of Islam member who became a Black Panther during the counterculture turbulence in Los Angeles in the late ‘60s. After trying unsuccessfully to convince Eldridge to come back into the Nation of Islam, Bunchy listened intensely to Eldridge’s reason for leaving and, after much thought, Bunchy left the Nation of Islam. Eldridge was paroled to the Bay Area, where he would become a writer for the anti-establishment publication Ramparts Magazine after the popularity of his book “Soul on Ice” that sent literary shockwaves throughout America. Eldridge was eventually coaxed into joining the Black Panther Party by both Huey P. Newton and Bobby Seale, who cofounded the organization on Oct. 15, 1966. After Eldridge convinced Bunchy that the Black Panther Party was the best movement for him, Bunchy returned to Los Angeles with plans of organizing the Southern California Chapter of the Black Panther Party. Many of Bunchy’s early recruits came from his past gang connections, along with community people and some from a conscious think tank group he started called The Radicals. 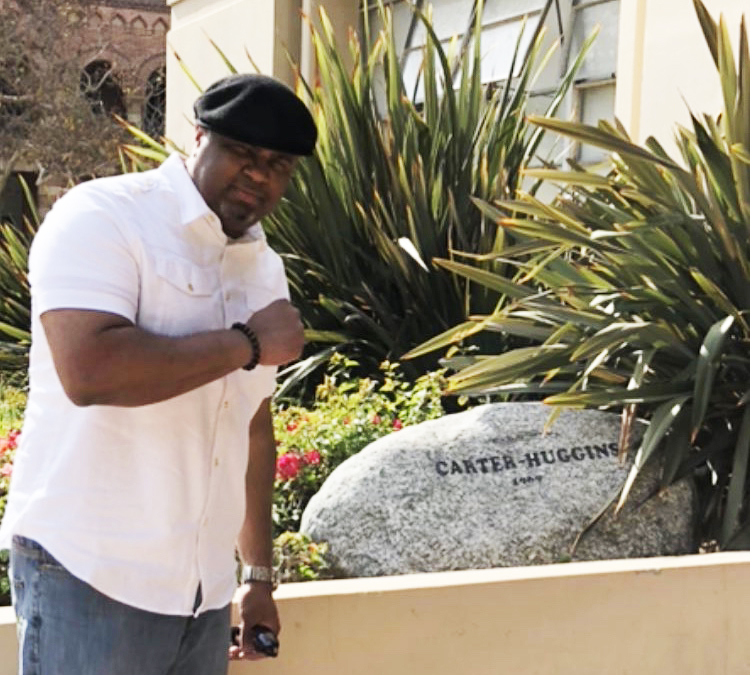 Malik Ismail pays homage to Bunchy Carter and John Huggins at their memorial at UCLA. Amongst those recruited were Brothers Ronald and Roland Freeman, Wayne Pharr, Long John Washington, Franco Diggs, Jeffrey Everett, Gil Parker, Muhammad Mubarak, John and Ericka Huggins, Elmer Geronimo Pratt, Elaine Brown, Tommy Lewis, Steve Bartholomew, Robert Lawrence, Flores Forbes, Gil Parker, Bunchy’s half-brother Arthur Morris and many others. The Southern California Chapter of the Black Panther Party was arguably the most capable chapter in the Party with its accomplishments, national leadership impact and resistance to the LAPD, FBI and CIA, who waged a war against them. With the backdrop of Los Angeles, high theatre was the constant script imposed upon these Panthers by the city’s power structure dedicated to destroy the SoCal Panthers. An example of this theatre was when the LAPD tried to charge Geronimo Pratt for the Tate-Labianca murders, which were actually committed by the Charles Manson “Family” members who killed actress Sharon Tate, her unborn child, her four friends and the son of her gardener in August 1969. The authorities tried to link Geronimo to the crime because “Death to the Pigs” was written in the residence and Sharon Tate’s blood was written the word “Pig” on the front door. Manson intended to start an apocalyptic “Race War” in America under the term “Helter Skelter”, the scenario to bring this into reality. The next night the Manson “Family” murdered Leno Labianca and his wife to conclude their murderous spree with their eventual capture. The power structure in L.A. was able to frame Geronimo for what was termed the “Tennis Court Murder.” Two Black men robbed a married couple named Olsen in Santa Monica, killing the wife while the husband survived. On the same night as this crime in L.A., Geronimo was in Oakland attending a meeting, and a phone call between him from the Bay Area and a female party member in Los Angeles was suppressed during his trial. Only the false testimony of FBI informant “Panther” Julio Butler would be used to connect Geronimo to this crime, for which he spent 27 years in prison as an innocent man. The L.A. “high theatre” continued with the controversy around actress and Panther supporter Jean Seburg, who committed suicide in 1979 as a result of being a victim of the FBI’s Counter Intelligence Program or COINTELPRO because of her support of the Panthers. The FBI’s false propaganda implied that her unborn baby was fathered not by her husband but instead by L.A. Panther Raymond “Masai” Hewitt. Jean Seburg’s child died two days after she gave birth in August 1970 and she made sure to prove the accusation was false by having an open casket to show the baby’s clearly white skin. Seburg never recovered emotionally from these FBI COINTELPRO actions and eventually took her own life. After Geronimo’s framing by the power structure, the “Bunchy Panthers” eventually disbanded and for years Los Angeles had no “Panther” movement until B. Kwaku Duren reorganized the Southern California Chapter of the Black Panther Party in 1976 under the national leadership of Elaine Brown with dedicated members like Kato Cooks, Charles “Boko” Freeman, Shareef Abdullah, Virginia Harris, Larry Hardy, James David Barnes, Nida Day, Gregory Franklin, Michael Carter, Bobby Smith, Bobby Johnson, Larry Page and other supporters of the reorganized Southern California Black Panther Chapter in Los Angeles, which continued to serve the community until the demise of the entire Black Panther Party in 1981. In accordance with the historical “high drama theatre” of Los Angeles, the O.J. Simpson trial and the rebellion following the Rodney King verdict in the ‘90s shocked the nation and inspired B. Kwaku Duren along with other SoCal members Shareef Abdullah, Charles “Boko” Freeman and community activists to create a resurgent “Panther” Movement in Los Angeles with the founding of the New Panther Vanguard Movement (originally the New African American Vanguard Movement), which emerged in Los Angeles with the objective to rekindle revolutionary activism in the community. The Vanguard’s first large scale community event was dedicated to Bunchy Carter on Oct. 15, 1994, when Bunchy Carter’s mother, Nora, was given gifts of appreciation and 1,000 bags of free food were given to families in need. The NPVM continued serving the community of Los Angeles through survival programs with free food giveaways, Seniors against Fearful Environments (SAFE), Busing to Prisons Program, Women, Infants and Children Program (WIC), Free Basic Health Care, computer literacy programs, English as a second language program, other programs along with reissuing The Black Panther Newspaper (1995-2001) and establishing broad based coalitions nationally and internationally without much fanfare. Its own demise came in 2002 after a suspicious fire destroyed the office for the organization, aptly named the International Panther Headquarters, which was located at 1470 West Martin Luther King Jr. Boulevard in Los Angeles, and an internal split in its ranks. But the NPVM made a great impact on the people of Los Angeles in the 1990s and early 2000s, thanks to its roots in the work of Alprentice “Bunchy” Carter beginning in 1968. From an historical perspective and in the words of L.A. Hip Hop legend Ice Cube’s song, “My Summer Vacation,” “L.A. ain’t all surf and sun”! Malik Ismail is an international traveler, historian and activist. He’s explored many cultures in Africa, including in Ghana, South Africa and Egypt. He’s traveled to Cuba and South America. He visited Rio de Janeiro and Salvador Bahia, Brazil, including the favelas of Rocinha and Cidade de Deus (City of God) in Rio and recently visited Haiti and the Dominican Republic. Former Panther minister of information for the New Panther Vanguard Movement and an honorary member of the Southern California Chapter of the BPP (1976-1981), his writings have been featured in the L.A. Watt’s Times, It’s About Time BPP Newsletter, Rolling Out Magazine and The Black Panther International News Service. He’s the author of the book, “From Old Guard to Vanguard: A Second Generation Panther.” Email him at omawalex@yahoo.com and visit his website, http://malikaismail.wix.com/malikismail#!home/mainPage. It’s great fr all of us.